Virtualize Steam/TF2 installation to keep Windows Clean? Thread: Virtualize Steam/TF2 installation to keep Windows Clean? Even so, it isn't Steam making this system slow to get going, it's all the other stuff. I don't mind as long as it stays speedy when it gets to the desktop - this rig runs 24/7. Superfetch. It was pushing 300MB as of a few minutes ago. You don't HAVE to install Steam on C: in the first place. Just move the folder Steamapps outside Steam so you won't have to download the content again. Move Steamapps folder inside the new install folder. In the worst case, you're just going to have to go to each game in the library, right click on it , Properties, and click there the "verify integrity". If you want to be sure, you can check using Process Explorer from SysInternals Suite - you can find it on Microsoft's site. If Windows is on C:, then yes you do. I understand you can host the files on a different drive, but once it makes registry entries, it begins the slow and painful process of win rot. Better to use portable apps where possible, and sandbox the rest. How did I install Steam on K: on my computer then ? My whole C: partition is 230 GB and my Steam folder is about 182 GB... it would be crazy to install Steam on C: in the first place. Start the registry editor by typing regedit in Run/Search and pressing Ctrl+Shift+ Enter (to start it in elevated mode/admin rights). If you don't use Ctrl+Shift+Enter, you might find the keys read only and you may not be able to edit them. Find Steam in the list, change it to the new path. The value is "K:\Steam\steam.exe" -silent on my computer. This will only be here if you've configured Steam to automatically start when you log in. Restart the computer, and Steam should start from the new drive and run everything from the new drive. If you want to make sure, rename Steam in Program files to Steam2 and see if everything still runs. It will run. If there's something wrong, revert the changes back to the original ones and reboot and everything will work as before. You may be moving the files that Steam uses to run onto another drive, but Windows makes sense of the installation through the registry... where is the registry again? But the main point is not to make sure that nothing gets written to C:. Rather, the point is that when programs make changes to the registry, it mucks up Windows. The effect is cumulative when lots of keys are being entered and changes made, and in general, I agree that Steam itself is not as bad, say, as Norton or AIM, but I do think it's an offender. Steam actually behaves quite well as far as the Registry is concerned. Esspecially compared to others, where M$ itself is its worst offender. Steam installs, writes stuff in registry and thats it, it doesn't rewrite in registry ever 5 minutes. 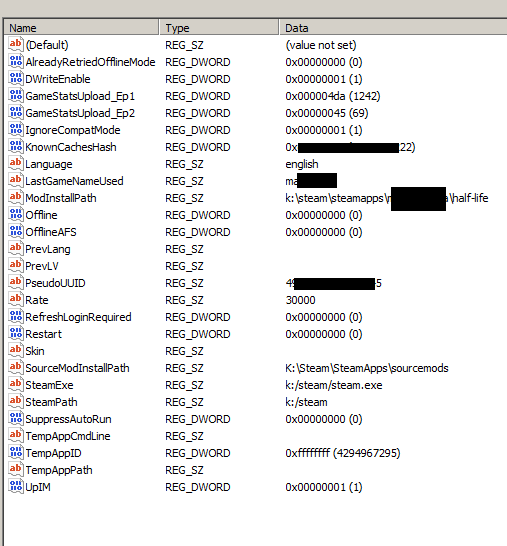 Yes, portable apps (eg ccleaner, and others) are a lot better; i would even argue that batch-files are even better; but it is what it is... and as i said, there are far worse offenders. I would not worry toomuch about what steam does in the registry; what it does to (video)memorywith its overlay is far , far worse. As for registry,... there are tools for cleaning/maintaining the registry. As for steam, it has been pointed out that you can install it anywhere, preferably on another drive. However, since you have SSD, this nifty little app "steam mover" allows you to put individual games onto your C: drive. In most cases that is not needed, but there are a few games **cough**rage**cough** that benefit from launching off an SSD. As for Virtualisation.... Win7 comes with XP emulation (M$ VirtualPC) out of the box for Pro/Enterprise/Ultimate. But you could install Virtual PC and make your own XP image in it. Unfortunately.. VPC emulates an SVGA (S3 Trio) card... which is not exactly well suited to play anything more complex as solitare. There are other VM emulators, but the ones that can actually use the underlaying GPU to its fullest are rare, and not free. Reality is futile; you will be assimilated by (your) perception. Convert GPT windows disk to MBR without damaging the installation?